Viking Cruises has secured a Main Avenue show garden at RHS Chelsea to highlight the launch of its ocean venture and garden designer Alan Gardner has used his unique skills to create The Viking Ocean Cruises Show Garden after ‘forensically’ studying architectural drawings and images of Viking Star. Viking Star, a 930-passenger luxury ship complete with infinity pool and snow grotto spa, will be christened in Bergen on 17 May, Norway’s Constitution Day, the weekend before the world’s greatest flower show. Father-of-three Alan, from Sutton Coldfield, has been diagnosed with Asperger’s Syndrome. He says: “My condition, which is a form of autism, means I am really obsessive about detail. I have gone over and over every aspect of the ship, studying the website, videos, brochures – everything ­- but the garden will actually be conceptual. “I’m not trying to recreate the ship but something that has the essence and sensation of being on the ocean. “A series of elements will appear to be floating; decking panels will be raised two inches off the ground and a ripple-patterned patio of very fine resin-bonded white gravel will have a smooth, undulating surface. There will be bands of brushed steel ripples, too. “The garden will be very structured but with a sense of movement. I’ll have blue aquilegia poking through the decking and there will be a soft matrix of planting – frothy, glassy and white, like an ocean spray. “I’ll use semi-shade and woodland plants as well as incorporating some beautiful white multi-stemmed Himalayan birch trees, Betula jacquemontii. “The ship has a Winter Garden, a serene space near the pool with dappled light coming through the canopy of what looks like trees. It’s very much a Scandinavian-designed environment, so yes, the birch trees could just be a nod to that space. 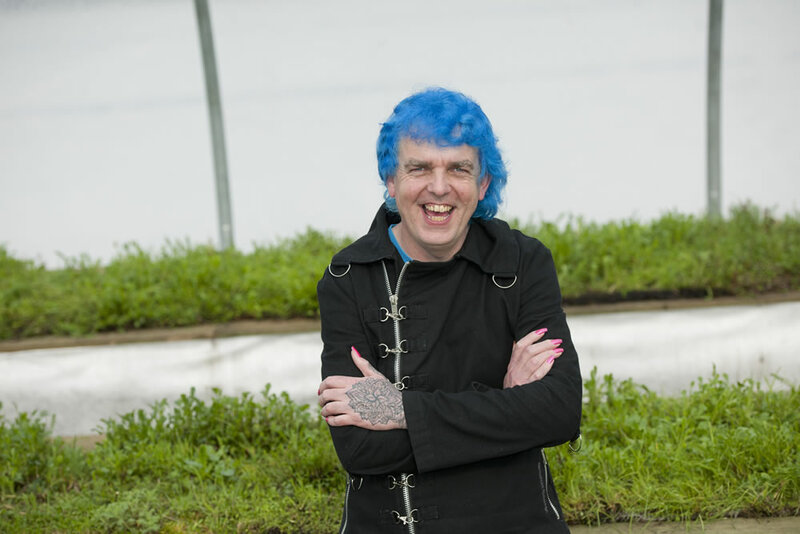 Alan, who will star in Channel 4’s The Autistic Gardener series later this year, is instantly recognisable because his hair is always dyed either bright blue or shocking pink. He has created more than 40 RHS show gardens and has won numerous awards, including two gold medals at Tatton Park, but says his first show garden on the Main Avenue is ‘something special’. He said: “I am so excited. Since getting my first cactus as a teenager I have never wanted to do anything else but to be involved in gardens and garden design, so to actually be on the Main Avenue is fantastic! Wendy Atkin-Smith, managing director of Viking Cruises UK said: “We are delighted to celebrate the inaugural sailing of the Viking Star, our first ocean vessel, with a Main Avenue garden at RHS Chelsea. RHS Chelsea runs from 19 to 23 May. Viking Star is the first of its ocean cruise ships and Viking Ocean Cruises guests will enjoy curated itineraries designed to showcase the destinations, with a complimentary excursion in each port and an on-board cultural enrichment programme that includes lectures, local speakers and interactive demonstrations.